Gardeners know that their gardening efforts will reap the most rewards with perennial plants. In nature, perennials flower and produce seed, and then that seed is dispersed usually in summer or fall, germinating either in the fall or the following spring. Below are four reasons you will benefit from sowing perennials in fall. 1. Hassle-free stratification: Some perennial seeds remain dormant until after they experience the cold temperatures of winter. This need for cold to break a seed’s dormancy is called stratification, and it prevents seeds from germinating at the wrong time. Take advantage of nature’s process by sowing in the fall, or mimic winter conditions by putting moistened soil/media and seeds in a sealed plastic bag in the refrigerator for 6 week before sowing them. 2. Earlier blooms and larger plants: Perennials live for more than two years and can take several years to get to their mature size. By sowing perennial seeds in the fall, plants will be more mature the following spring, allowing many types to flower their first growing season. 3. Care-free moisture management: Most regions have winter rain and/or snow, providing essential moisture at a time when most of us don’t think to water. Cool weather also reduces the need to water as frequently. 4. Control weeds with ease: Cool weather slows weed germination and growth, making your nicely prepped and planted garden area easier to maintain. 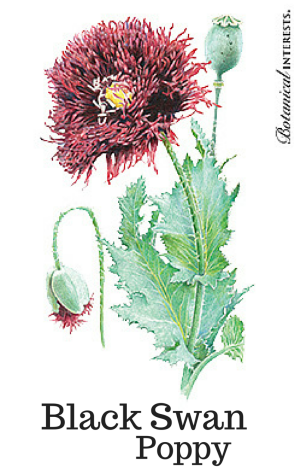 Visit us and see our great selection of Botanical Interests perennial plant seeds, including new varieties!